This weekend is going to be a cooking weekend for me! 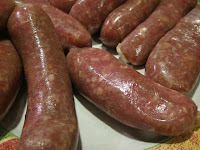 I've been looking forward to making sausages ever since our lesson over the summer, but then got delayed by my finger. That darn pinky sure caused a lot of problems! Anyway, I bought casings on line from the Sausage Source and, while I was at it, got another cookbook. You can never have enough cookbooks. 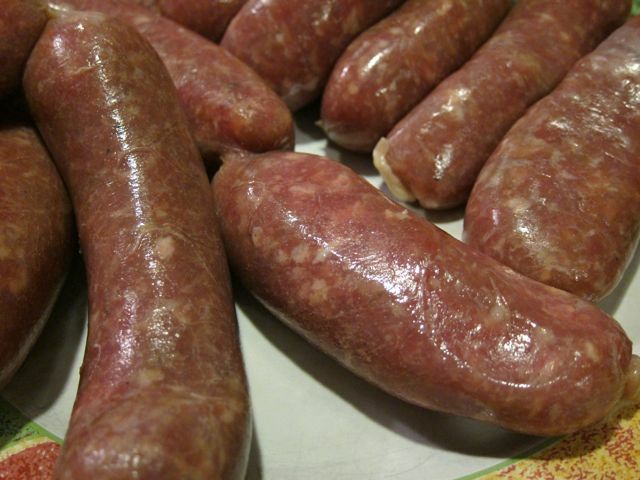 Yesterday I made Maple "Breakfast" sausages. I put "breakfast" in quotes because, well, since I didn't have sheep casings they were not going to be breakfast-sausage-size. I don't think it will be a problem to have them for dinner tonight. Or to have larger sausages at breakfast. 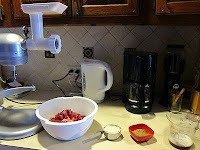 First, the mise en place: the meat (a pork shoulder) was cut up and frozen for 30 minutes to make it easier to grind. The spices and liquids were measured out. I had the right amount of chopped onion. 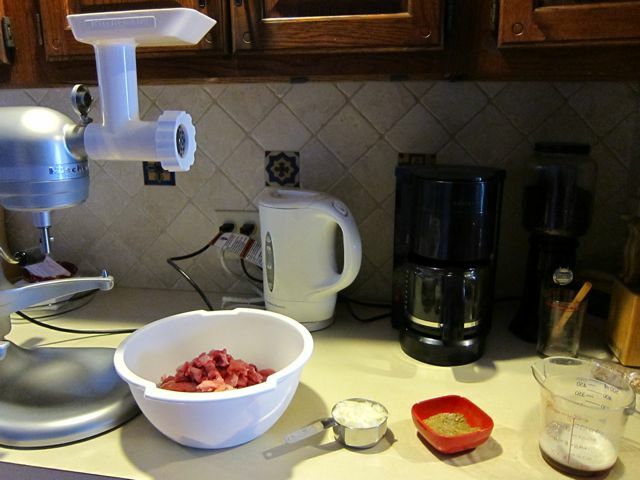 The grinder was set up and ready to go. I started the grind. Even with the cold meat, the grinder did get clogged and I had to disassemble, clean and reassemble before I could complete the process. Once the me at was ground, I added the chopped onion and ground it again. Then I mixed in the spices and the maple syrup and milk. Everything went into the fridge at this point because I had it in my head that I had to go to the mall. I never did make it to the mall. The traffic was amazingly bad. After I got home, I prepared the casings and started stuffing. I had been planning on waiting for my husband, since it is easier with 4 hands, but couldn't wait and did it myself. Instead of twisting each link as it was filled, I filled the whole casing and then twisted them when they were done. That was a lot easier, as long as the casing wasn't overstuffed. 15 links total. They've sat overnight in the fridge and I just froze 2 bags of 5 links each. The other 5 links are for dinner tonight! Isn't anticipation great? These look really good. 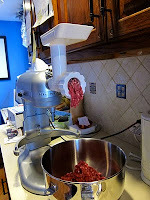 I have been flirting with the idea of making sausage myself lately only I would have to make patties because I don't have all this lovely equipment that you have. Anyway, you have inspired me to get moving on that. Just had dinner... they are awesome! 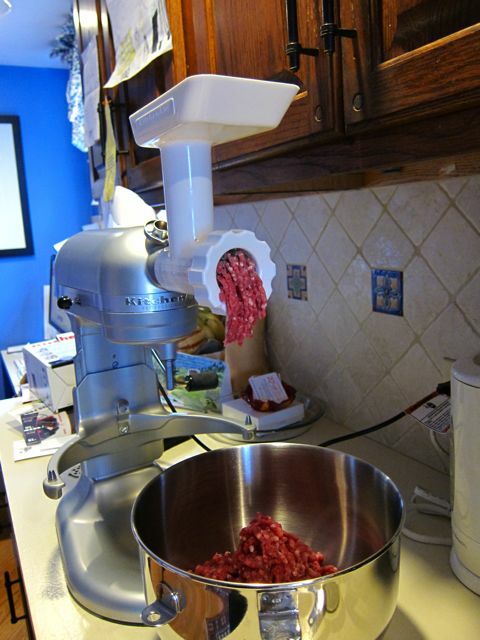 One of my books suggests making a tube of sausage and chilling it that way, then slicing the patties later. Kind of like cookie dough, I guess! I think that would work well, thanks for the idea. Nice to see the grinder being put to good use!